1. In a heavy stockpot, heat 1/4 inch of oil until very hot. Working in batches, fry tortilla strips until crispy. Drain on paper towels and set aside. 2. Pour off all but 1 tablespoon of the oil. Fry the chicken on high for about 5 minutes or until it begins to brown. Add the onions and cook another 5 minutes or until brown. Add potatoes and broth; bring to boiling and simmer, covered for 10 minutes. 3. Add corn, chilies and cilantro or parsley. Return mixture to boiling and simmer another 5 to 8 minutes or until vegetables are tender. 4. 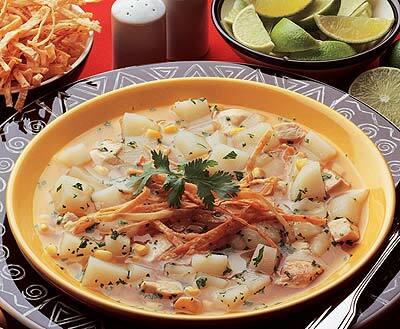 Divide tortilla strips among soup bowls. Ladle soup on top of strips, and squeeze a lime wedge on top of each portion. Note: Potatoes may be peeled, if desired.